Shortcuts are necessary. Of course I wish I had the time to make homemade bread or my own hummus each week, but the reality is I have to take some shortcuts. There are weeks where I can find a few extra hours to go the extra mile in the kitchen, but when I can't, I'm turning to meals like this one! I took Martha Stewart's more complicated recipe and introduced a few shortcuts, such as a bag of frozen vegetables and cooked and shredded chicken I already had on hand. I omitted onion (was trying to avoid any chopping!) and added a teaspoon of kickin' chicken seasoning to jazz up the flavor (which worked tremendously well!). These changes saved me at least 20 minutes which may not seem like much, but it's amazing what else I can get done in those 20 minutes! As it turned out, I ended up freezing this and cooking it a few weeks later. It help up remarkably well and is going on my list of freezer meals to make during my next marathon freezer-cooking session with friends. 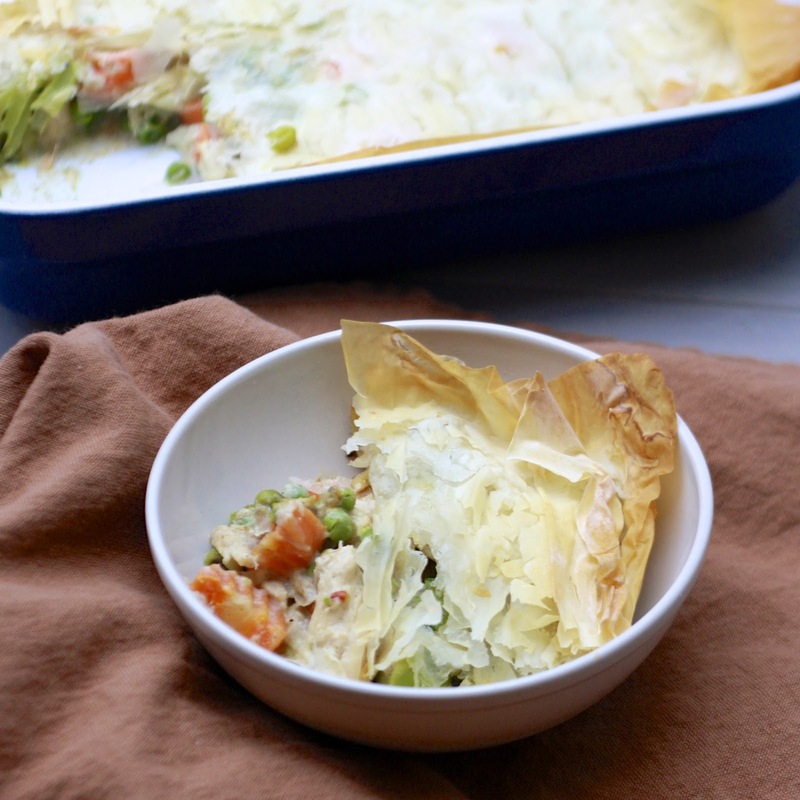 My only comment is that phyllo doesn't reheat well in the microwave; we didn't mind eating it the second night a little soggy, but you may want to plan to share with friends or divide into smaller portions if you know you'll have leftovers! 1. Heat olive oil in a large skillet over medium heat. Add vegetables (excluding peas) with thyme and additional seasoning, if using. Season with salt and pepper and cook until vegetables have softened. Add flour and cook, stirring, for 1 minute. 2. Gradually add milk, stirring until smooth. Cook, stirring occasionally, until mixture begins to simmer and thicken. 3. Remove from heat and stir in chicken and peas. Further season with salt and pepper if desired. Pour filling into a casserole dish (mine was 11 x 7). 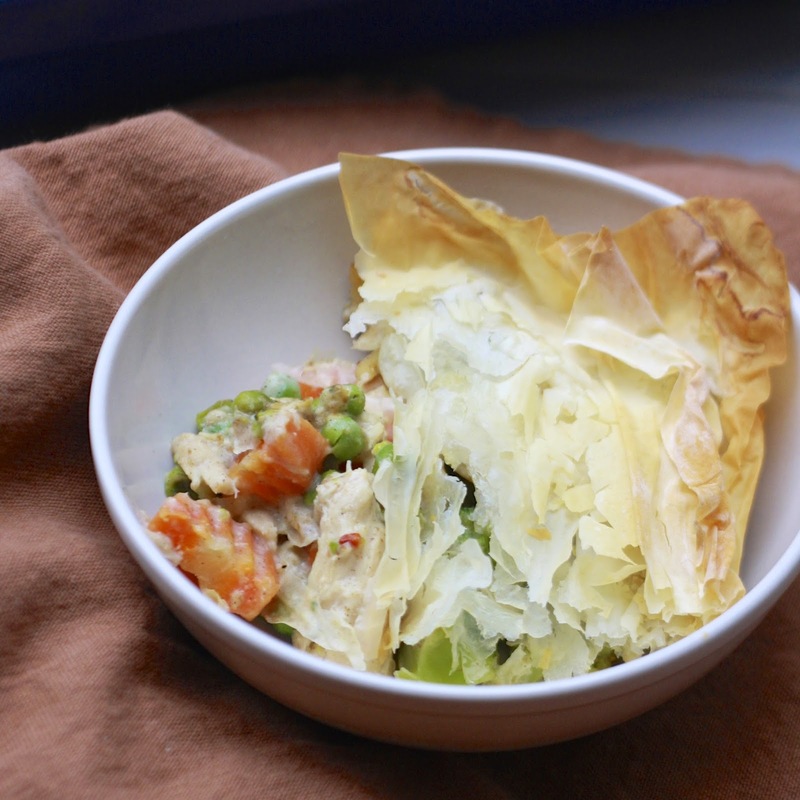 Working quickly, lay a piece of phyllo on top of the filling. 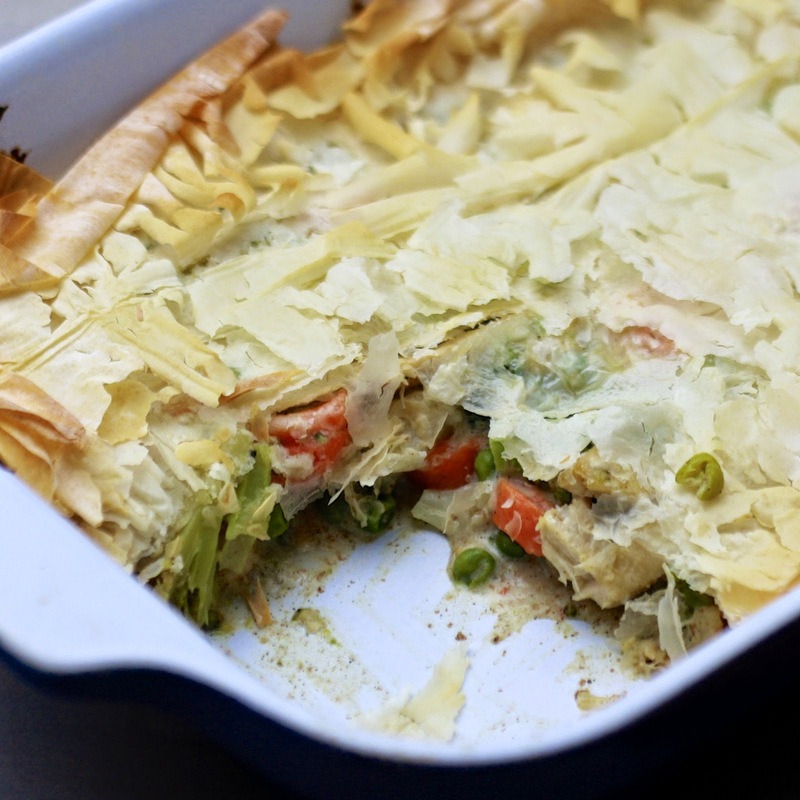 Brush lightly with olive oil and repeat with remaining pieces of phyllo. 4. If cooking immediately, bake at 400F for 20-25 minutes. If freezing, wrap tightly with foil and freeze. To bake, allow to thaw overnight before cooking at 400F for 20-25 minutes.